This incredible conversation took place just a few weeks ago at the AcademyHealth’s Annual Research Meeting in Boston. I had the great fortune to be in the audience; in fact, I think I may have been the only person in this session of more than 400 attendees who actually had Dr. Donabedian as a professor while at the School of Public Health at the University of Michigan close to 40 years ago. One of my fond memories of his teachings was in his first chapter of Aspects of Medical Care Administration: Specifying Requirements for Health Care, which addresses the importance of the values and purpose of health care organizations in the establishment of an evaluation of a health care organizations’ performance. The original framework (1990) used to develop the Healthcare Effectiveness Information Data Set (HEDIS) was Donabedian’s structure, process and outcome. During the session at the AcademyHealth meeting, which was titled “Beyond Structure, Process and Outcome: Reflections on 50 Years Since the Donabedian Model,” the panelists reflected on Dr. Donabedian’s landmark article, Evaluating the Quality of Medical Care published in the Milbank Quarterly, where he laid out the quality framework of structure, process and outcome. 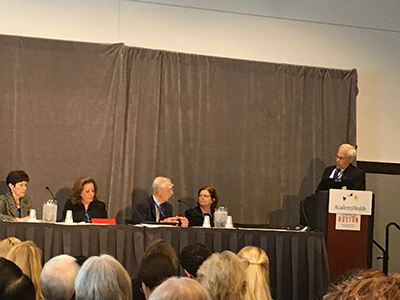 Don Berwick, moderating the session, asked the panelists what they thought Dr. Donabedian would be most proud of given current efforts to advance quality and safety, as well as what would he be disappointed by in 2016. They delved into a discussion on how quality measures have evolved and improved, as well as how teamwork has become an important component of quality and safety. I then thought about the larger mission of the ABIM Foundation—to advance professionalism to improve health care. The authentic engagement of physicians is central to our mission because without them the full potential of developing high-performing health care organizations and teams will be compromised. I wondered what Dr. Donabedian would think about the Choosing Wisely campaign and the participation of more than 70 specialty societies that have developed over 400 recommendations on wasteful tests and procedures. He was a hard marker and would probably question why more conversations were not happening between physicians and patients regarding their goals, preferences and options, and why more delivery systems have not implemented more recommendations into practice. He would question why more investment is not being made in developing measures and evaluating what works in reducing waste. I think Dr. Donabedian—as well as Dr Leape—would agree that the ABIM Foundation’s mission is of critical importance and would urge us to not only continue, but to increase our efforts with initiatives like Choosing Wisely so that we can further legitimize the power and force of professionalism to improve health care.